Messier 59 (M59) is an elliptical galaxy located in the southern constellation Virgo. The galaxy has an apparent magnitude of 10.6. 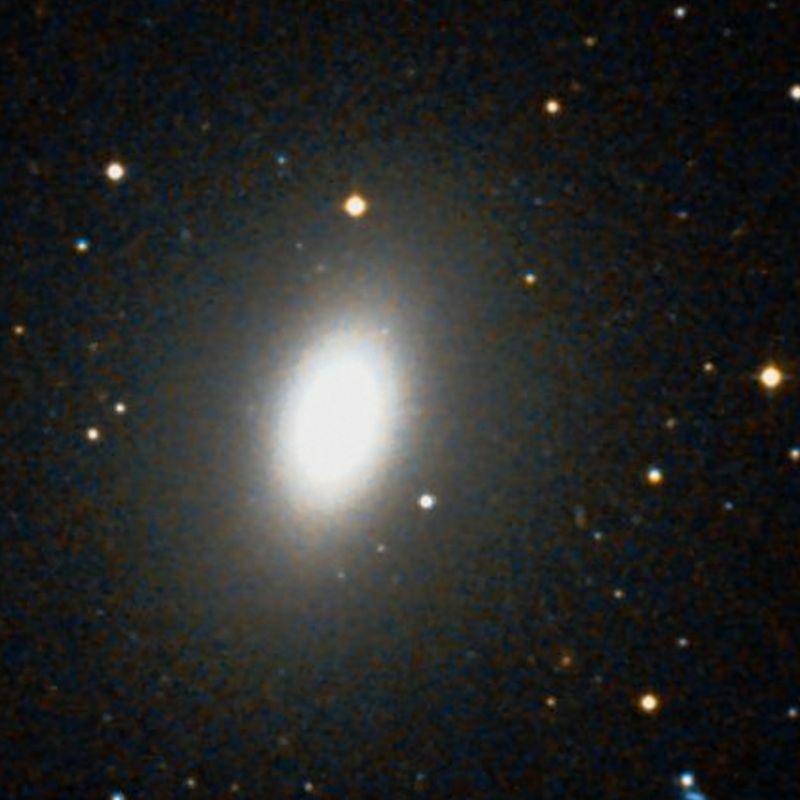 M59 lies at an approximate distance of 60 million light years from Earth. 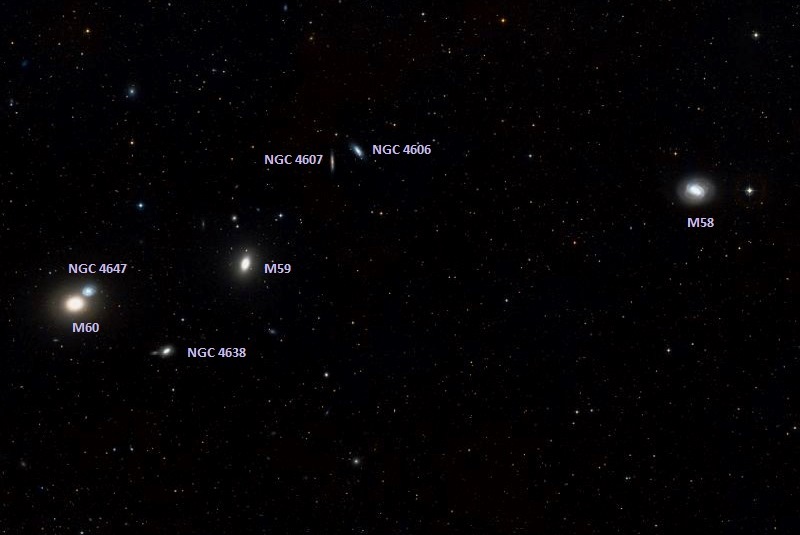 It has the designation NGC 4621 in the New General Catalogue. Messier 59 can be found in the region of the sky between the bright stars Vindemiatrix in Virgo and Denebola in Leo. 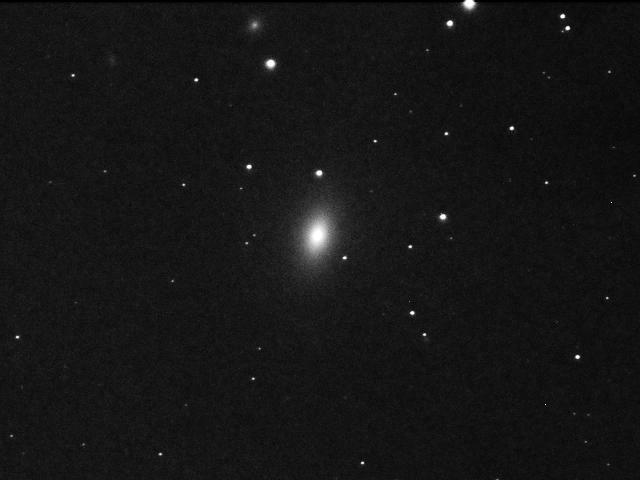 Going 4.5 degrees west and a bit north from Vindemiatrix, one can find the giant elliptical galaxy Messier 60 and its fainter companion NGC 4647. M59 lies a bit further to the west of M60. Messier 59 is best seen in larger telescopes. Smaller instruments will only reveal a small elliptical patch with a brighter core. Being 5.4 by 3.7 arc minutes in size, the galaxy is considerably longer in one direction than in the other and appears very ellipsoidal in shape. The central region of M59 is clearer in medium-sized and large telescopes, but even larger instruments do not reveal much detail. 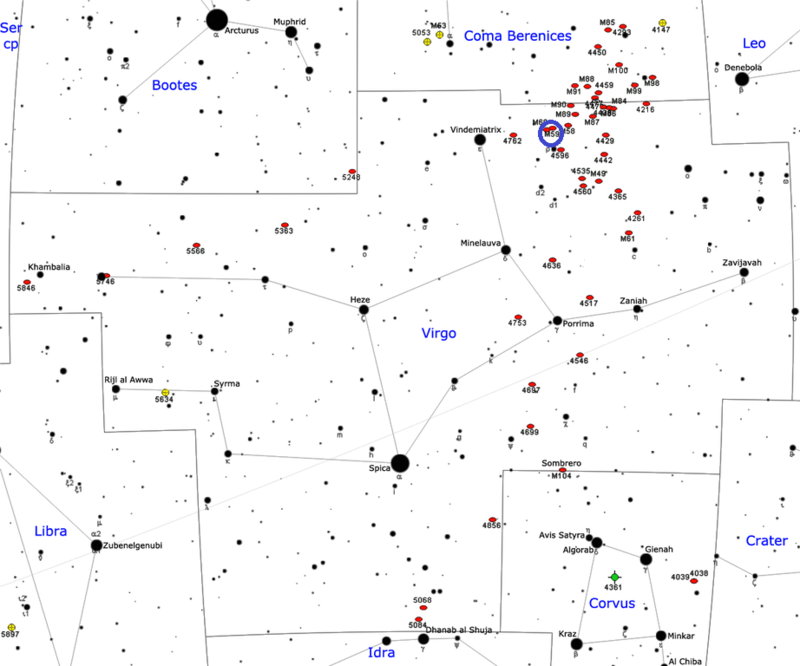 The best time of year to observe M59 is during the spring. Messier 59 is a member of the Virgo Cluster, a group of about 1,300 galaxies (and possibly many more) that form the heart of the Virgo Supercluster, a larger grouping that also contains the Local Group, which in turns contains the Andromeda Galaxy (Messier 31), the Triangulum Galaxy (Messier 33), and our own galaxy, the Milky Way. M59 is one of the larger ellipticals in the Virgo Cluster, but it is still significantly fainter and less massive than Messier 87, Messier 49 and Messier 60. Messier 59 contains a supermassive black hole with a mass about 270 million times that of the Sun at its core, which is almost 100 times more massive than the black hole at the centre of the Milky Way. The galaxy’s central region – the inner 200 light years – rotates in the opposite direction to the rest of M59 and is the smallest ever region in a galaxy known to do so. Messier 59 has an exceptionally large number of globular clusters. Astronomers have estimated a population of about 2,200 globulars, which is an impressive number, even if the three giant Messier ellipticals – M87, M49 and M60 – contain even more. M59 is also known to contain an inner disk of stars. A supernova was detected in the galaxy in 1939. Designated SN 1939B, the supernova reached a peak magnitude of 11.9.